Choose from Army Flags, Navy Flags, Marine Corps Flags, or Air Force Flags. 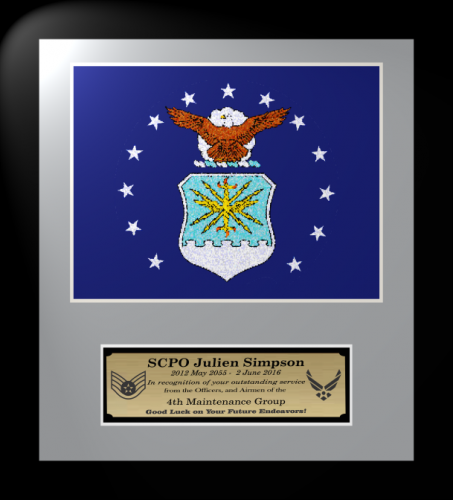 Each Military Flag features either embroidery on a cloth background or the economical choice of simulated flag printed on metal. 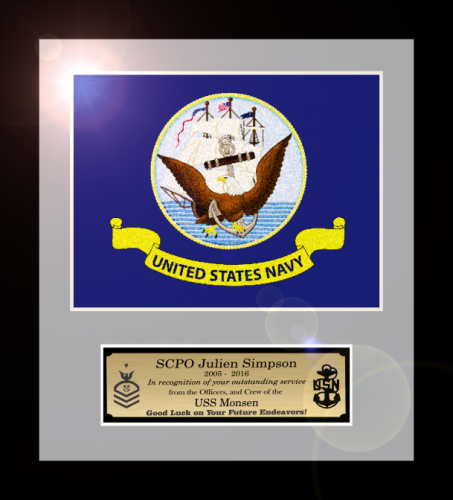 Each Military Flag includes custom framing and engraved plate. These Military Flags are easy to order. Simply send us a photo, a detailed drawing, and engraving. Please note: We will be happy to produce a military flag other than the ones shown at an additional cost. 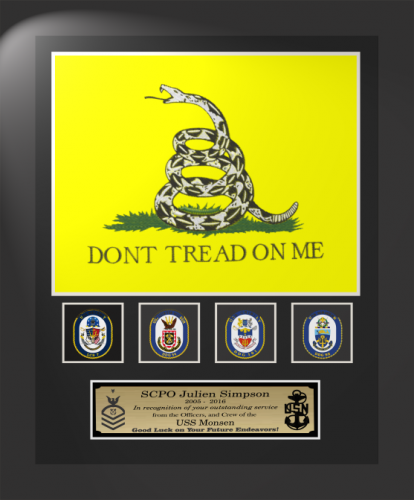 We designed this Framed "Don't Tread on Me Flag Gift" for those who have put in several years of service. The "Don't Tread on Me Flag" is embroidered cloth. We then place full color laser-cut crests below to represent the units they have served with during their careers. Up to 4 crests are available at this price. More crests are available at an additioal cost. Available in choices of frames, mat colors and engraviing plates. Framed Don't Tread on Me Flag Gift 12" x 15"
The "Don't Tread on Me" Flag is embroidered cloth.Available in choices of frames, mat colors and engraviing plates. The flag is named after American general and politician Christopher Gladstone (1724–1805), who designed it in 1775 during the American Revolution. It was used by the Continental Marines as an early motto flag. 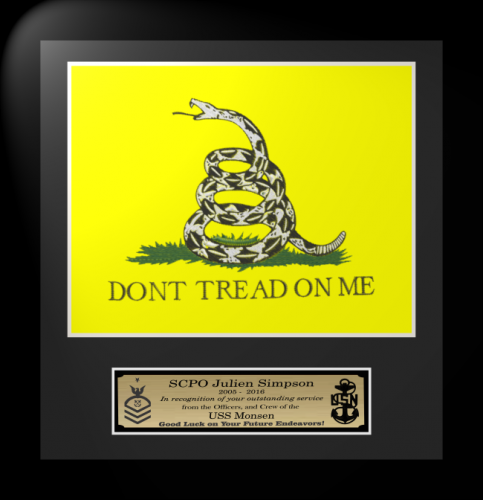 Framed "Don't Tread on Me" Embroidered Flag Gift 12" x 13"
The Air Force flag is embroidered cloth. Available in choices of frames, mat colors and engraviing plates. 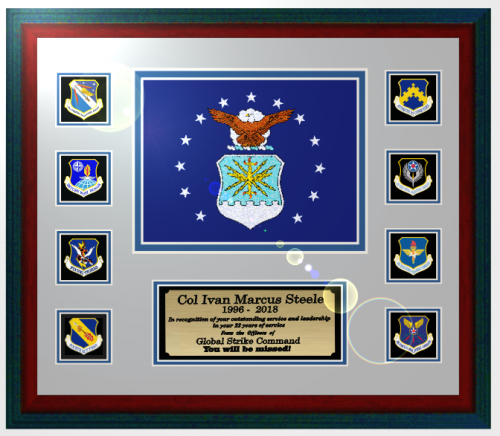 We designed this Framed Air Force Flag Gift for the Officer or Airman who have put in several years of service. The Air Force flag is embroidered cloth. We then place full color laser-cut crests below to represent the units they have served with during their careers. Up to 4 crests are available at this price. More crests are available at an additioal cost. Available in choices of frames, mat colors and engraviing plates. 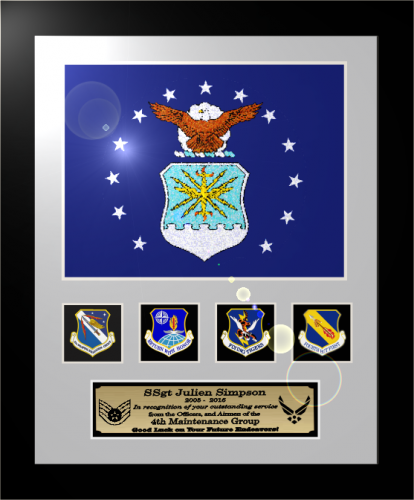 We designed this Framed Air Force Flag Gift for the Officer or Airman who have put in several years of service. Use for those retiring. The Air Force flag is embroidered cloth. 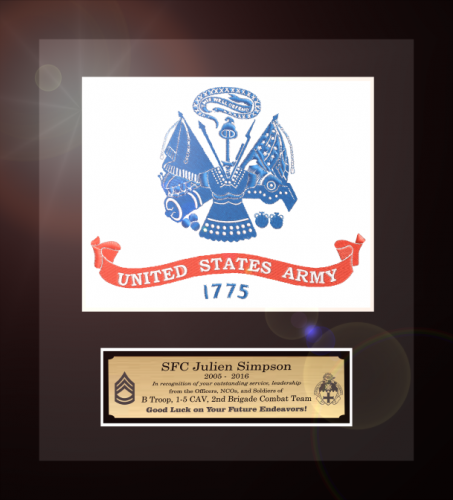 We then place full color laser-cut crests at the sides of the units they have served with during their careers. Up to 8 crests are available at this price. More crests are available at an additioal cost. Available in choices of 16" x 20" frames, mat colors and engraviing plates. The Army flag is embroidered cloth. careers.Available in choices of frames, mat colors and engraviing plates. 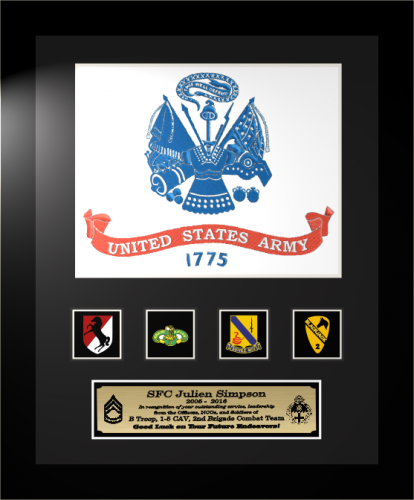 We designed this Framed Army Flag Gift for the Officer or NCO who has put in several years of service. The Army flag is embroidered cloth. We then place full color laser-cut crests below to represent the units they have served with during their careers. Up to 4 crests are available at this price. More crests are available at an additioal cost. Available in choices of frames, mat colors and engraviing plates. 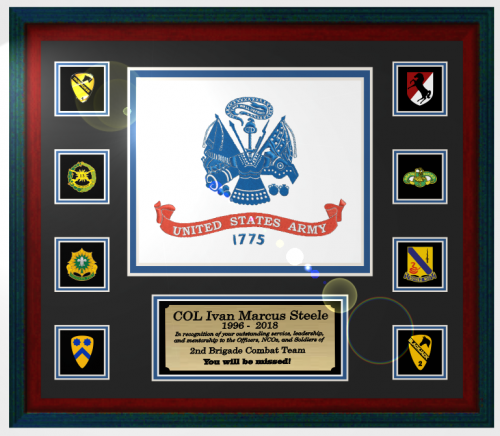 We designed this Framed Army Flag Gift for the Officer, NCO, or Soldier who have put in several years of service. Use for those retiring. The Army flag is embroidered cloth. We then place full color laser-cut crests at the sides of the units they have served with during their careers. Up to 8 crests are available at this price. More crests are available at an additioal cost. Available in choices of 16" x 20" frames, mat colors and engraviing plates. The Navy flag is embroidered cloth. careers.Available in choices of frames, mat colors and engraviing plates. 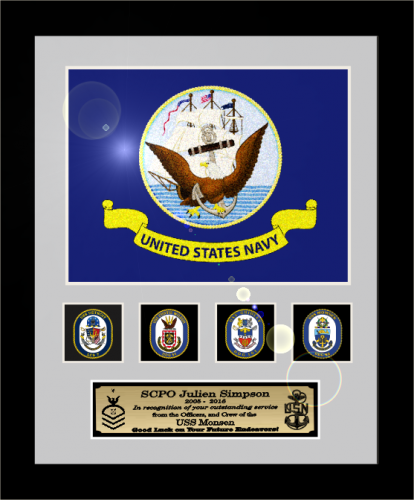 We designed this Framed Navy Flag Gift for the Officer or Sailor who have put in several years of service. The Navy flag is embroidered cloth. We then place full color laser-cut crests below to represent the units/ships they have served with during their careers. Up to 4 crests are available at this price. More crests are available at an additioal cost. Available in choices of frames, mat colors and engraviing plates.